The barbell biceps curl targets your biceps. Be especially careful if you have elbow problems. Whenever you add weight and bend a joint, it increases the stress to that joint. Therefore, if you have a weakened joint, you need to exercise extreme care not to overdo it and cause an injury. If you have lower-back problems, you may want to choose a seated biceps exercise instead. Hold a barbell with an underhand grip and your hands about shoulder-width apart. Stand with your feet as wide as your hips, and let your arms hang down so the bar is in front of your thighs. Stand up tall with your abdominals pulled in and knees relaxed. Bend your arms to curl the bar almost up to your shoulders, and then slowly lower the bar almost to the starting position. DON’T swing your elbows out wide as you bend your arm to raise the weight. Keep your elbows close to your body without supporting them on the sides of your stomach for leverage. DON’T just let the weight fall back to the starting position. Lower it slowly and with control. Cable biceps curl: Place the cable on the setting closest to the floor and attach a short or long straight bar. Hold the bar with an underhand grip and stand about a foot away from the cable tower. Curl the weight up and down exactly as in the basic version of the barbell biceps curl. Double biceps curl: Hold a dumbbell in each hand with your palms facing up, elbows resting lightly against your sides, and arms hanging down. Curl the dumbbells up and down together as if they were a barbell. 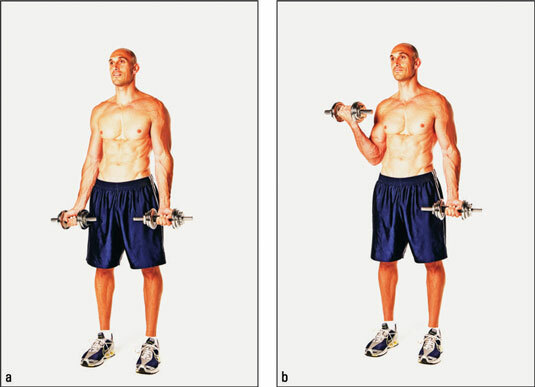 The alternating biceps curl exercise helps balance out the strength in both arms. By pulling the weights up through the midline of your body, you also strengthen your abdominals muscles. 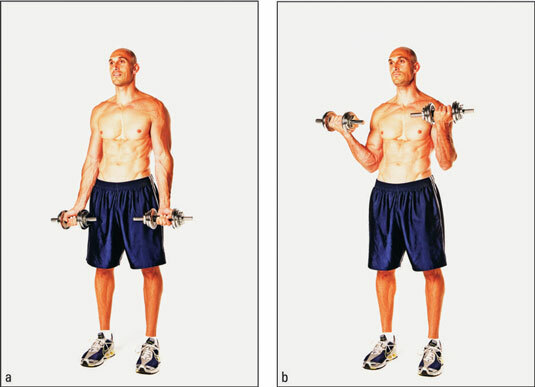 Hold your dumbbells with an underhand grip and your hands about shoulder-width apart. Stand with your feet as wide as your hips, and let your arms hang down so the weights are in front of your thighs. Stand up tall with your abdominals pulled in and knees relaxed. Pull in your abdominals as you slowly bring your right weight toward your right shoulder. Hold for a few seconds and then release the weight back down to your right side. Repeat on your left side. Repeat for 2 sets of 10 repetitions. DO contract your abs before lifting them to your shoulder. DO concentrate on your biceps muscle as you do this exercise. DON’T jerk the weights up to your shoulders. Hammer curl: Using dumbbells, start with palms facing in and keep your palms facing in throughout the motion. Imagine that you’re pounding nails into a board with two large hammers. This version of the exercise puts more emphasis on your forearm muscles, as well as some of the muscles that reside underneath the biceps. Zottman curl (harder): Instead of beginning with palms facing back, begin with palms facing front with an underhand grip. As you curl your arm upward, rotate your palm in toward your body and bring it up and across to the opposite shoulder. This version of the dumbbell curl is slightly harder than the basic version. Seated biceps curl: If you find yourself cheating too much even with light weights, try sitting on a bench or a chair. The arm-curl machine focuses on your biceps. Be careful if you’ve had elbow injuries. Adjust the seat so when you sit down and extend your arms straight out and angled down, your shoulders are above your arms. Sit down and grasp a handle in each hand with an underhand grip. Bend your elbows and pull the handles up toward your ears and in toward your shoulders, and then slowly lower the handles back down with control. DO sit up tall and make an effort to pull exclusively with your arms as opposed to hunching up your shoulders or leaning back. DON’T use a chest pad to help lift the weight. If there’s a pad, use it for light support only. 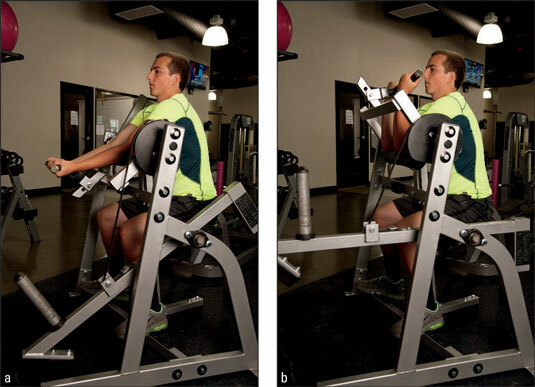 Some gyms have arm-curl machines that do a fair job of mimicking dumbbell work: The two sides aren’t connected so each arm has to do the work of lifting the weight. This type of machine is a good substitute or supplement for free weight work.